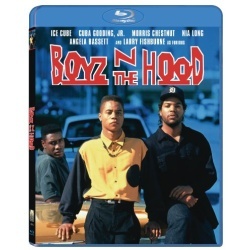 The critically acclaimed story about three friends growing up in a South Central Los Angeles neighborhood, and of street life where friendship, pain, danger and love combine to form reality. "The Hood" is a place where drive-by shootings and unemployment are rampant. But it is also a place where harmony co-exists with adversity, especially for the three young men growing up there: Doughboy (Ice Cube), an unambitious drug dealer; his brother Ricky (Morris Chestnut), a college-bound teenage father; and Ricky's best friend, Tre (Cuba Gooding Jr.), who aspires to a brighter future beyond the "The Hood." In a world where a trip to the store can end in death, the friends have diverse reactions to their bleak surroundings. Tre's resolve is strengthened by a strong father (Larry Fishburne) who keeps him on the right track. But the lessons Tre learns are put to the ultimate test when tragedy strikes close to home, and violence seems like the only recourse.